The Fairhaven Selectboard watches a promotional video, created by CGI Communications at no charge to the town, at its meeting on Monday, 1/28/19, L-R: Town Administrator Mark Rees, Selectboard member Bob Espindola, Selectboard Chair Dan Freitas, Selectboard member Charlie Murphy, Assistant Town Administrator Vicki Paquette. 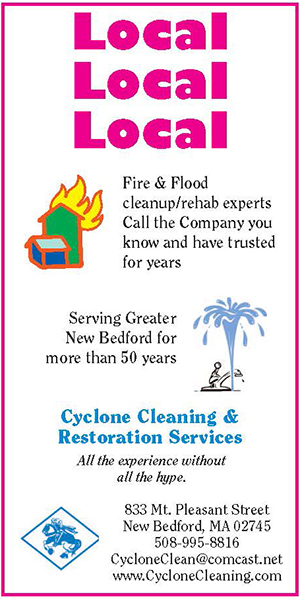 The videos are available on the town’s website at https://www.fairhaven-ma.gov. Photo by Beth David. 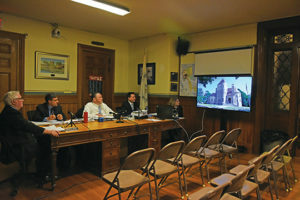 The Fairhaven Selectboard had two rather lengthy discussions at its meeting on Monday, 1/28/19, one with members of the newly revived Dog Park Study Committee; and another with some Board of Public Works members over reclassifying the sewer and water superin­tendent jobs, with both boards seemingly split on the solution. Geneva Woodruff and Vanessa Gralton addressed the board with a detailed explanation of how the Dog Park Study Committee used a variety of criteria to rank a number of town properties, including proximity to residences and parking. Ms. Woodruff also told the board that she had identified a grant from the Stanton Foundation that the project would qualify for. In 2014 and 2015, the previous committee had done a lot of research and had settled on using the Long Road Water Basin for a dog park. The new committee praised the research done on that project, but in the end came to a different conclusion. Ms. Woodruff said that the new commit­tee was hoping to put the park at Fort Phoenix, utilizing the Grimshaw Park property owned by the town. However, that property was donated to the town for the singular and expressed purpose of use by the town’s senior citizens, otherwise it would go back to the heirs of the original owners. The Grimshaw property meets all eight criteria, including access to water, some shade (but not too much), parking, drainage, and is not too close to homes. The other properties, including the Long Road Water Basin and the area in front of the Senior Center (where the cedar trees are), had at least one deal breaker. Long Road is too isolated and has no water; the senior center property might cause conflicts with seniors, and is also too close to Route 6. The board discussed the possibility of Long Road, Senior Center, and Grimshaw at length. Selectboard member Charles Murphy made his own point. “The Board of Selectmen never denied this project,” said Mr. Murphy. Mr. Freitas repeated his assertion that the people on the committee “dug their heels in,” saying they did not want brush there. A search of the Neighb News archives, however, showed that in August of 2015 (8/27/15 issue), the matter was discussed at the Select­board meeting, and it was a bit more complicated. The Dog Park Commit­tee members at the time said they had no problem with the area being used for overflow brush in the case of a storm. The BPW had already been barred from using the site for brush on a regular basis, it was only to be used for emergencies. Ms. Woodruff said that the committee now wanted Fort Phoenix anyway. She made the case that the dog park would be a use for seniors. She said it was underutilized as a park. It was donated in 1982, and only within the last couple of years did anything happen there. An Eagle Scout project installed some picnic tables. Mr. Freitas, however, pointed to a letter from Town Counsel Thomas Crotty that said the use would not be allowed. In the end the board agreed to contact the heir named in the agreement to see if he would be willing to allow the use of the land for a dog park. Another possibility would be to get the state to give the town the half-acre or so it would need for the park. The part of Fort Phoenix in question, near the tennis courts, is a wide open field that is not used very often by the public. Grimshaw Park abuts that part of the property, along Green Street. “This is a jewel of the town,” said an impassioned Ms. Woodruff, pleading her case to put the dog park where it would be seen and making a case for getting seniors to volunteer to maintain it. Anne Gardella made the case for using Long Road, though. She noted that it was frequented by people in the neighborhood, with or without their dogs. She said 25 people a day use it as a park now. She spoke against the senior center property, saying it would be too dangerous if a dog got away and ran towards the senior center. Ms. Woodruff noted that Ft. Phoenix was also an unofficial dog park. The board decided to have Mr. Rees ask about the Grimshaw Property. At some point in the discussion, Mr. Rees did disclose that Ms. Woodruff was his landlady. Selectboard member Bob Espindola called the grant a “game changer.” He said the committee would have to do a lot of outreach to let people know what was going on. Input from the community will be “very important,” he said. The matter will come up again at a future meeting. Meanwhile, the committee did have a resignation and is looking for a new member. Anyone interested should contact the Selectboard by email, Selectmen@Fairhaven-MA.gov, or by USPS, 40 Center St., Fairhaven, MA 02719. Ms. Woodruff said she hoped to find a long time resident, because she realized that most of the current members were not life-long Fairhaven residents. L-R: Fairhaven selectboard member Charlie Murphy, and Assistant Town Administrator Vicki Paquette share a laugh watching Mr. Murphy on the screen of a promotional video at the Selectboard meeting on Monday, 1/28/19. 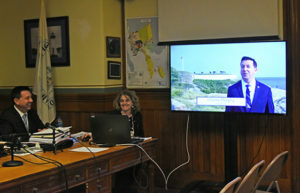 Eight videos were created by CGI Communications at no charge to the town, and are available on the town’s website at https://www.fairhaven-ma.gov. Photo by Beth David. The issue was the contracts for the water and sewer superintendents. As non-union employees that had no contract before the Personnel Bylaw was passed by Town Meeting in 2017, the two positions fall under that bylaw. The BPW, however, created contracts for the two positions, but had no authority to do so. The contracts are invalid, because the positions now fall under the new Wage Classification plan, putting the water superintendent at Level 20, Step 4, or $91,728; and the sewer superintendent at Level 20, Step 9, or $103,792. The problem was clearly the contract for sewer superintendent Linda Shick that she signed in June of 2018, although they never mentioned her name. She received a raise in June of about $7,000, according to Public Works Superintendent Vinnie Furtado, bringing her salary to $92,477.52, according to the contract. Just as they were about to make the motion and vote, BPW member Michael Ristuccia asked to speak and told the board it would “be a mistake” to approve the change because of “many problems” that needed to be addressed. Mr. Freitas, whose public clashes with Ms. Schick go back to Mr. Freitas’s days on the BPW, said in any case he would abstain (not recuse himself) from the vote. But he would not say why. “Correct me if I’m wrong,” Mr. Rees said to Mr. Furtado, to clarify that it was aproved already. “Yes,” said Mr. Furtado, or, at least, he thought so. Apparently, there is conflicting language in the special act that created the BPW and the change that created the Town Administrator form of government, said Mr. Furtado. It was clear, he said that the TA act assumed the BPW would be eliminated, but the town voted to keep it. The conflicting language needs to be cleaned up. In the end the board voted to wait until the 2/11 meeting to vote on it to make clear that the BPW would have supervisory authority over the two positions. Meanwhile, the contracts are not valid. Mr. Murphy asked that if Mr. Rees and Mr. Furtado took two weeks to talk about it, would there be any change. Mr. Freitas said he was against it because it could allow anyone with a contract to suddenly say they changed their mind and wanted to get another raise every six months: every union contract, every police officer. They will “rip it up,” he said and go before the Selectboard. Mr. Furtado said the contract “wasn’t worth the paper it was written on,” and it was only right to put the two positions into the wage plan at the level/step recommended by the study. Mr. Ristuccia asked them not to vote until the questions could be clarified. Mr. Murphy reiterated his earlier point, that if Mr. Rees and Mr. Furtado were not going to come to a different conclusion, then why wait. “No,” said Mr. Furtado, meaning the recommendation would be the same, because Town Counsel said the contracts were not valid. After joining in on the lengthy discussion, Mr. Freitas again said he would abstain, but still did not say why. Mr. Rees noted that if the two people in the positions had not entered into the contracts (which were not valid), they would be getting the wages as outline in the WC plan anyway. Mr. Espindola asked Mr. Freitas why he was abstaining, if there was a conflict. He said board members should not be abstaining just because they disagree. The board voted to postpone a vote until the 2/11 meeting, and asked for more information. Mr. Freitas abstained. In another matter, the board voted again to extend the temporary license for the Getty Station on Route 6. The company had asked for an extension to 2/26, but board members voiced their frustration with the owner’s multiple requests for continuations. “I’m not really happy about this without a reason,” said Mr. Espindola. Mr. Rees said he did not know the reason, and suggested that they extend it to the 2/11 meeting. They could then take action that night or extend it again. He said he would not be inclined to extend it on 2/11. Mr. Espindola supported the extension to 2/11. Mr. Murphy took the most flexible stance, saying that if they asked for an extension, there must be a reason. The board voted to extend the license to 2/11. In other business, the board gave final approval to Matt Loo for an additional aquaculture license. Mr. Loo obtained all the required approvals and will post a bond as required by the town’s regulations. The license is for two years.